There’s an undeniable element of romance associated with wine-paired dinners. It is a gastronomic experience involving multiple courses of delicious food paired with different wines to enhance the taste of every dish, as well as that of the corresponding wine. Being a pricey affair, the ambience is also usually luxurious. But when there are many options to choose from how does one distinguish one wine-paired dinner from another? While the quality of food and wine on offer is, of course, the primary factor, you could look at some unique pairings to make for an interesting experience. Gazapacho paired with a smooth, red Peppoli Chianti. 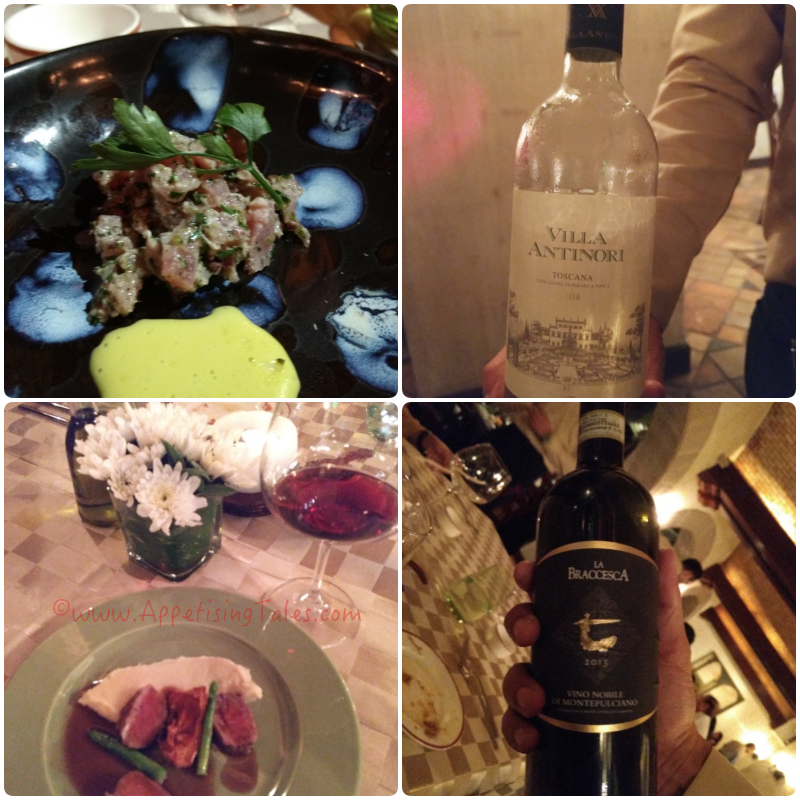 From the other wines, I really like the Villa Antinori Bianco, a light and crisp white wine that was paired with a brilliant tuna tartare with gin and mayonnaise. I would normally think twice before tucking into a raw fish preparation, especially in Delhi’s sweltering summer, but at La Piazza one rests assured that quality taken care of impeccably. Coming back to the wine, with its citrus notes and hint of green apple, it is ideal for sipping through the afternoon. The relatively low alcohol content - 12.5% - also makes it light and enjoyable. Bottom: Sous Vide Lamb Loin with a rich Pian della Vigne. The following courses see bolder wines paired with the pasta and the mains. 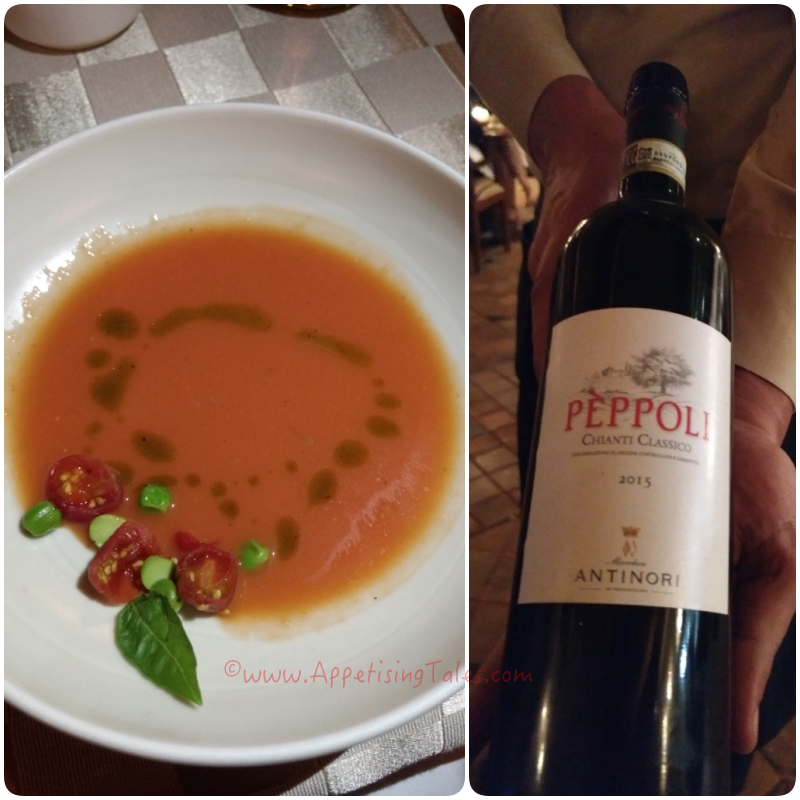 La Bracesca Vino Nobile de Montepulciano is 100% Sangiovese unlike the Chianti that was served with the gazpacho. Juicy red plums and ripe cherries lend it a fruit forward finish. This accompanies melt-in-the-mouth parmesan gnocchi in a porcini broth. And finally a sous vide lamb loin with natural jus and caramelized peach is a star on its own, but tastes even better with Pian delle Vigne Brunello di Montalcino. This is a very bold wine to match the rich flavour of the lamb, hence it is decanted and served in a bigger glass to allow it to really open up. While we are completely satiated by now, the perfect way to round off the evening is with a bite of dessert. I am glad that instead of an intense chocolate offering there is a light soufflé with candied orange ice cream. And that’s how we call it a (happy) night! Ciao!